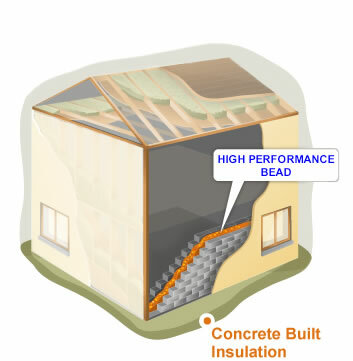 Highly efficient concrete built cavity insulation with a thermal conductivity of 0.033w/mk injected platinum bead insulation offers you the builder the choice of how efficient you want the house. Installation takes place during construction when windows are in and the roof is on. With conduit in place for both ESB connection and internal fuse board. Via the use of independent engineers to assess your requirements, we take off quantities required and provide a price and U-Value calculations. Which would include floor (if requested), cavity wall, any sloping or semi exposed walls, attic insulation) and wall ties. In order for us to accomplish this all we need is a copy of the plans. If requested, on completion of any developments, we provide you or your client with a full compliance/BER report for their records.